Readers may recall that on July 29th 2014 the BBC devoted considerable coverage to the story of an explosion at a power plant in the Gaza Strip. 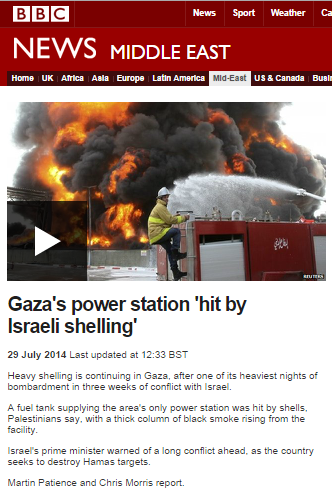 ““Power plant destroyed” screamed the sub-heading in a BBC News website report on July 29th 2014. 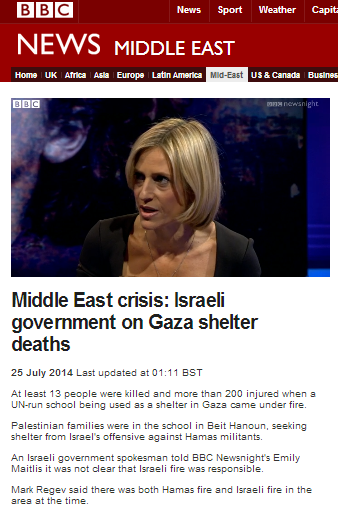 That article was among numerous items produced by the BBC on the same day which included content relating to what the BBC immediately concluded was an Israeli strike on Gaza’s power station. 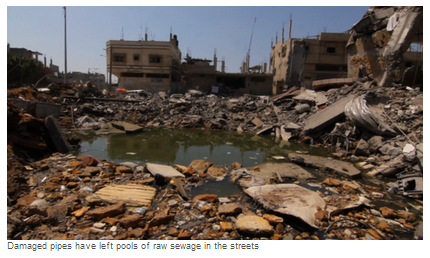 BBC journalists extensively promoted that version of the story despite the fact that Israeli sources had stated that the power plant was not deliberately targeted. A year later, the claims of deliberate targeting of the power plant were shown to be false but no effort was made to correct the misleading impressions and inaccurate information in those reports which still remain available online. 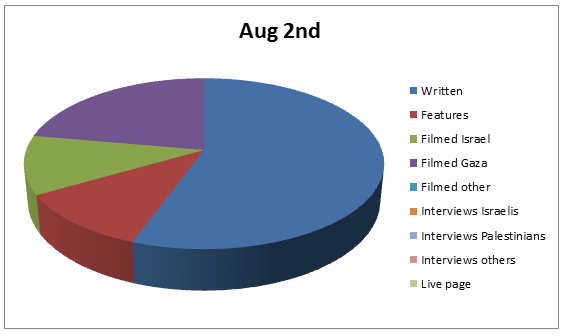 The Military Attorney General has now published the result of investigations into the July 29th 2014 incident and previous ones at that power plant (section 4 here). 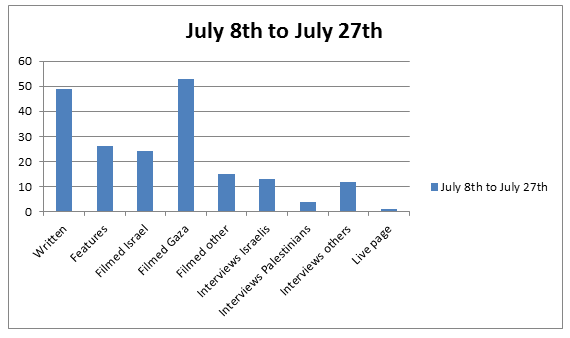 “In media reports, in IDF operational reports, and in the reports of international and non-governmental organizations, it was alleged that over the course of the period from 22 – 29 July 2014, the Gaza Strip’s power plant facilities, located in Nusseirat, were struck a number of times, as a result of IDF operations (the different sources refer to different events, and the allegations and figures contained therein are not consistent). It was further alleged, that as a result of the strike on the power plant on 29 July 2014, the plant ceased to function for a significant amount of time. Subsequently, the incident was referred to the FFA Mechanism for examination. Nevertheless, members of the public can still find BBC material online which inaccurately portrays the July 29th 2014 incident as a deliberate strike on that power plant. Clearly the appropriate clarifications need to be urgently added to those reports. The extensive multi-platform coverage promoted to BBC audiences on the anniversary of the beginning of last summer’s conflict between Israel and Hamas included a filmed item titled “Gaza conflict one year on: The power plant“. 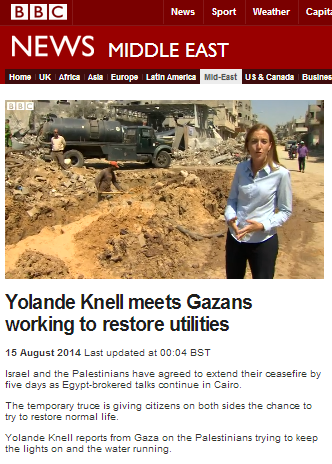 The inclusion of that topic was not surprising: the Gaza Strip power plant was featured extensively – though not always accurately – in BBC coverage of the conflict and some correspondents were quick to promote the notion that damage to the power plant’s fuel storage tanks was intentional and deliberate. Even after the circumstances of the July 29th 2014 incident became clear, the BBC made no effort to correct the inaccurate impressions given to its audiences at the time. 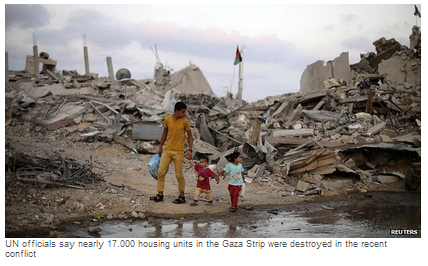 Last week the Gaza power plant was in the news again when, as AFP and others reported, production came to a halt. “The levying of fuel taxes by the finance ministry in Ramallah is preventing the (Hamas) energy authority from running the power station,” a statement from the authority said. The PA must “lift all taxes on fuel” to get the plant up and running, it said. Hamas pays the PA for fuel imported to Gaza, but is short of cash and had been unable to cover the additional costs in tax. In December, Qatar stepped in and donated $10 million (nine million euros) to the PA to cover the tax, effectively exempting Hamas from paying it. But that money has dried up, and the PA is insisting Hamas begin paying the tax again, the Islamist movement says. 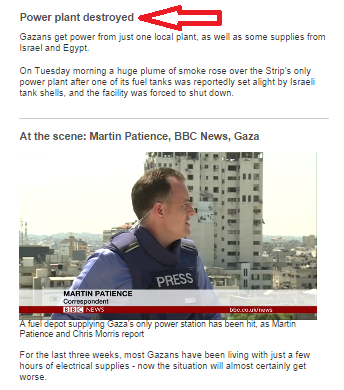 Last summer’s reporting on the topic of the Gaza Strip power plant included descriptions from BBC correspondents of the potential effects of the plant’s closure on civilian life. “And it is Gaza’s only power plant so there are electricity cuts in Gaza City, there could be problems with water supply because many of the area’s water pumps also rely on that power plant. 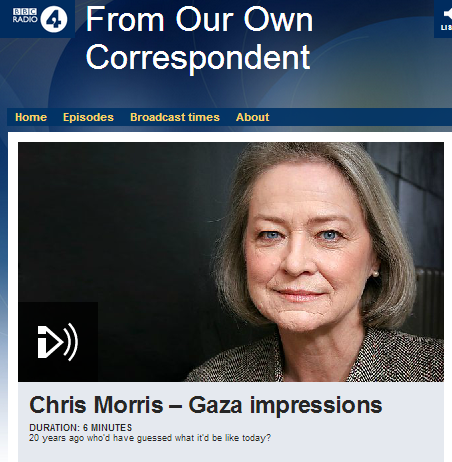 So if that was a deliberate Israeli attempt to cause economic pain – which is certainly how most Palestinians will see it – then it could be fairly successful.” –Chris Morris, BBC WS ‘Newshour’, 29/7/14. “It [the power plant] would to serve electricity for the civilian in Gaza almost 2 million people who are, I mean, suffer and when you are talking about electricity we are talking about water supply, water treatment plant, water sewage plant and we are talking about hospitals, we are talking about the schools. All aspects, all basic of our life requirements are not existing.” – Interview with the power plant manager, Yolande Knell, BBC television news, 15/8/14. 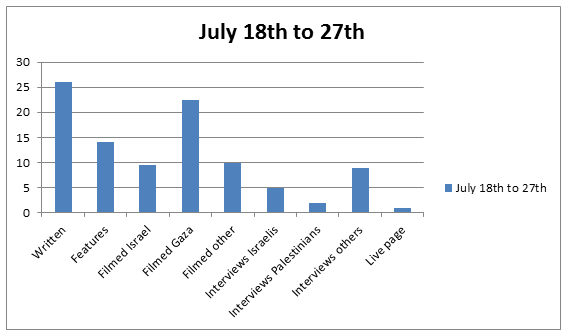 Notably, there has been no BBC coverage whatsoever of the power plant’s most recent closure, the effects of that on civilian life in the Gaza Strip or of the long-running dispute between Hamas and the PA which led to this latest shut-down. As readers may recall, BBC audiences received extensive coverage of that incident –and whilst the all-important context of the legitimate military target was not available at the time, BBC reporters did not hesitate to convey their own speculations on its background, as shown in the couple of examples below. 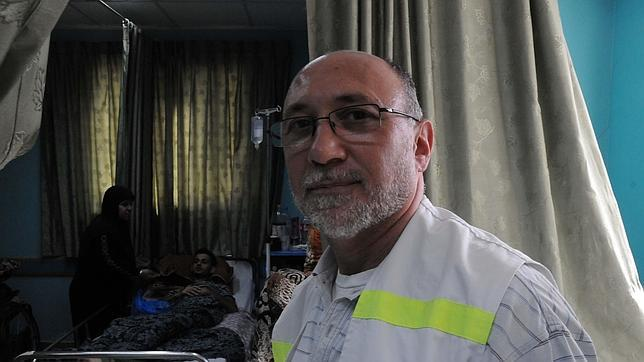 “And it is Gaza’s only power plant so there are electricity cuts in Gaza City, there could be problems with water supply because many of the area’s water pumps also rely on that power plant. 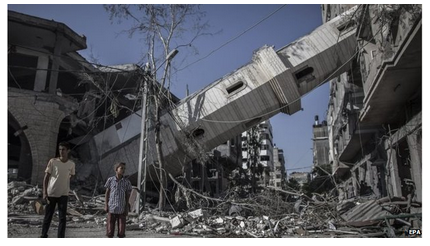 So if that was a deliberate Israeli attempt to cause economic pain – which is certainly how most Palestinians will see it – then it could be fairly successful.” – Chris Morris, BBC WS ‘Newshour’, 29/7/14. 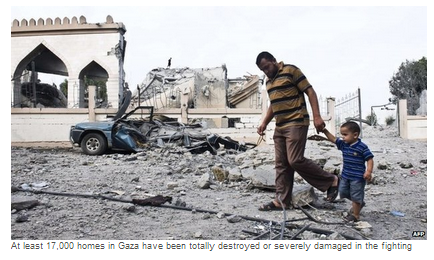 “Israel wants to weaken Hamas any way it can, which includes hitting Gaza’s only power station – adding to the misery of those who live here.” – Ian Pannell, BBC television news and BBC News website, 29/7/14. 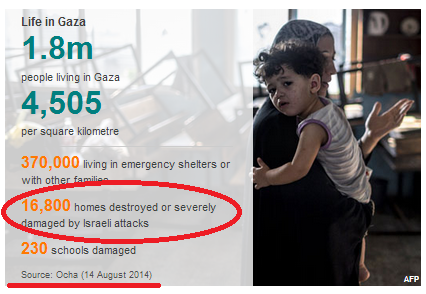 This is of course far from the first time (see ‘related articles’ below) that claims made by BBC journalists during the conflict between Israel and Hamas in July and August 2014 – many of which are still available in the public domain – have been shown to be inaccurate. To date the BBC has made no effort whatsoever to correct the inaccurate information communicated to its audiences by journalists who – at best – failed to source the full range of information before appearing on air and promoting conclusions based on their own pre-existing prejudices. 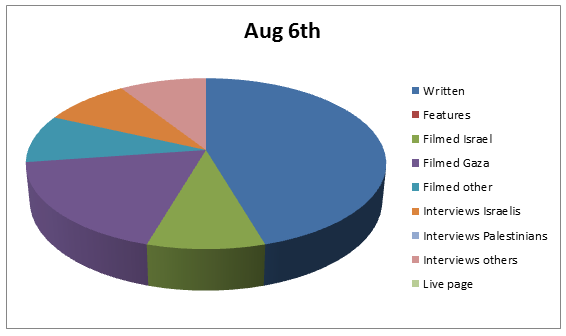 “Power plant destroyed” screamed the sub-heading in a BBC News website report on July 29th 2014. Just over two weeks later, both television viewers and visitors to the BBC News website were again reminded of the story in filmed and written reports by Yolande Knell. 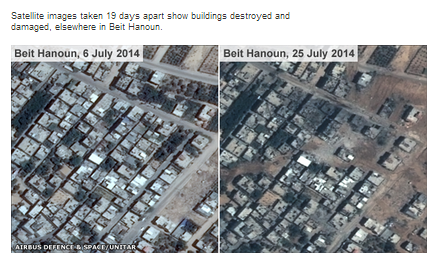 “At the end of last month, there was a huge fire at the only electricity plant after it was hit by Israeli shelling. Its fire extinguishing systems were struck and then its fuel tanks were set ablaze. 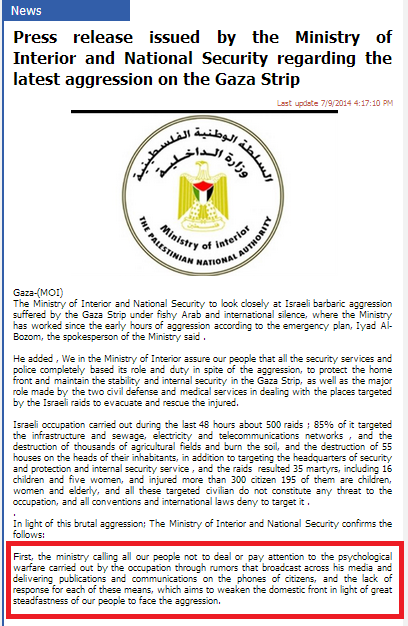 The Israeli army says it is investigating what happened but the effects are clear. “As you see, it’s total damage. It’s scrap,” says the Gaza power plant general manager, Rafik Maliha, as he points to the huge crumpled metal vats in the fuel storage area. However, Elder of Ziyon now reports that – despite the grim picture painted by foreign media, including the BBC – the power plant is now ready to return to operations. Remarkably – especially given the amount of coverage the BBC devoted to the topic at the time – that news has yet to be reported by the corporation. 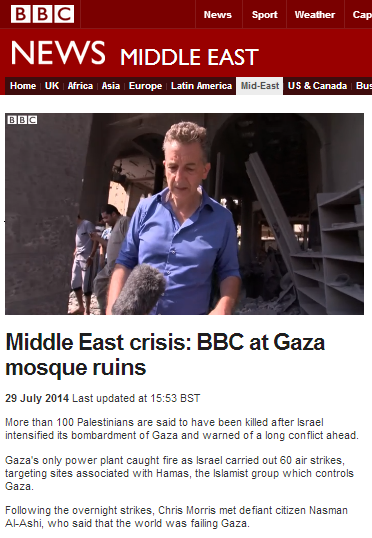 Readers no doubt remember that on July 5th – three days before Operation Protective Edge commenced – the BBC’s World Editor Andrew Roy appeared on the World Service’s ‘Outside Source’ programme to explain how the BBC ensures equal coverage of what the programme termed “Israel-Palestine”. Let’s take a look at the accuracy and validity of Roy’s claims by using a test case: BBC Radio 4’s ‘From Our Own Correspondent’. Between July 8th (commencement of Operation Protective Edge) and the present, eight editions of the programme have been broadcast. The first two (July 10th and July 12th) did not include any content related to the conflict in Israel and the Gaza Strip. The July 17th edition included an item by Yolande Knell (available here from 00:42) which was introduced by presenter Kate Adie using the description ‘fasting under fire’. 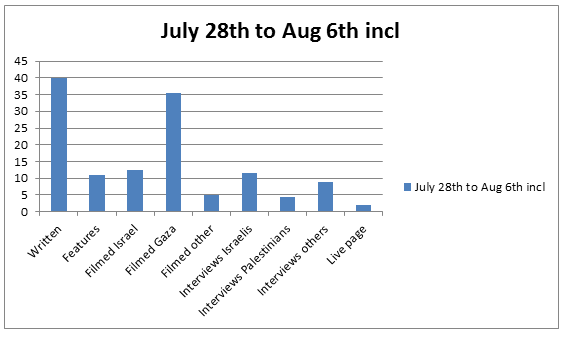 Knell’s report focuses entirely on the presentation of life in the Gaza Strip with descriptions of shortages of food, frightened children, reduced business in markets and evacuees. 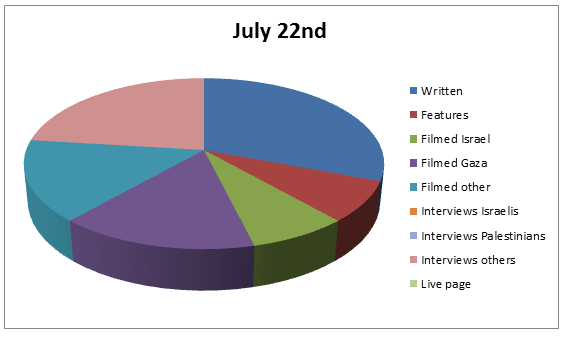 Much focus is also put on the topic of border restrictions with Knell twice quoting interviewees referring to a “siege” which of course does not exist and no explanation given regarding the terrorism which brought about the border restrictions. 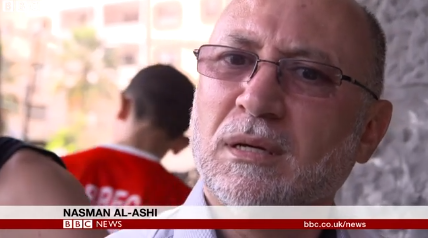 The BBC’s Middle East editor makes no effort to inform listeners that Hamas is not interested in the kind of “permanent settlement” which has been on the table for two decades, neglecting to inform them that Hamas was one of the Palestinian factions which rejected the Oslo accords. Although he makes no effort to inform listeners of the fact that nine years ago, when Israel withdrew, Gaza stood at a crossroads which could have taken it in a very different direction had its leaders not chosen terrorism as their raison d’être, notably Adams does tell of things which – like the rest of his colleagues – he failed to report whilst he was in Gaza. 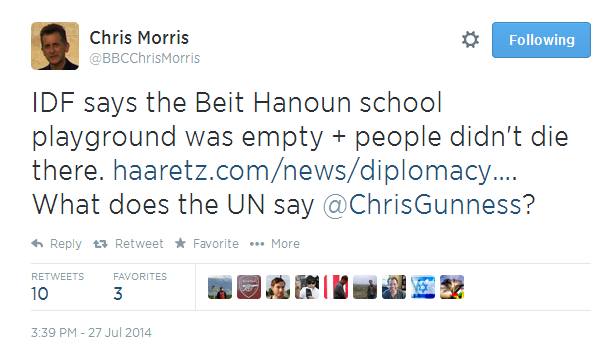 Like his colleagues, Morris of course makes no attempt to explain to listeners that it was Hamas terrorism against Israeli civilians which brought border restrictions into being. The August 16th edition of the programme featured a report by Kevin Connolly on the children of Gaza already discussed here and with the audio versions available here from 06:00 or here. 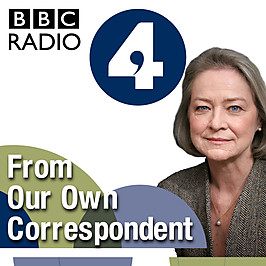 As we see, between July 17th and August 16th six editions of ‘From Our Own Correspondent’ on BBC Radio 4 included items pertaining to the conflict in Israel and the Gaza Strip. 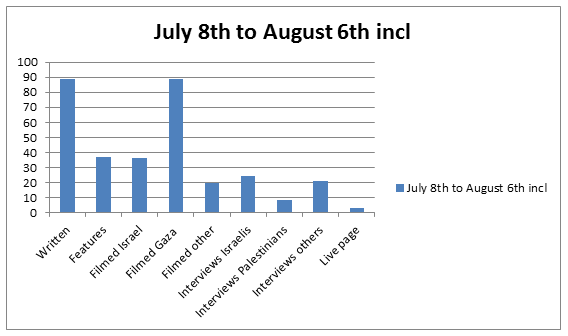 Only one of those items presented an Israeli point of view, with the other five not only presenting the opposite viewpoint, but often promoting the terminology of a terrorist organization and failing to provide essential context. Surely even Andrew Roy cannot possibly claim that any attempt was made to “give fair balance to each side” in that series of programmes.